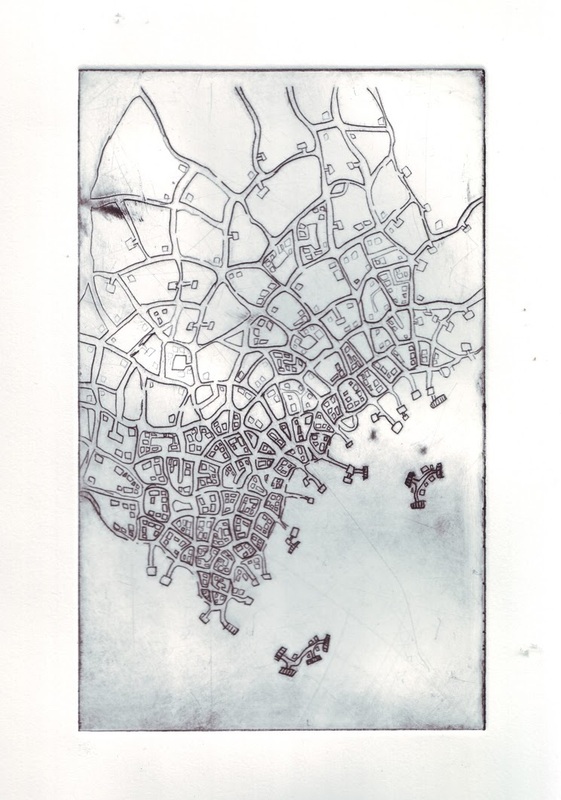 Last weekend I took a workshop at Maud Morgan Arts on drypoint, a printmaking technique that involves etching lines directly onto a plate. 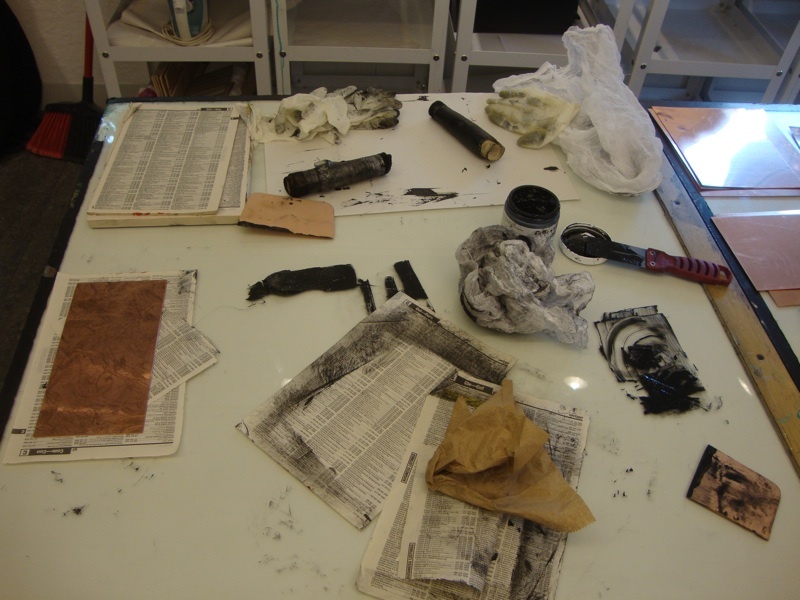 I’ve never tried that kind of printmaking before — the only prints I’ve made have been with linoleum or woodblock, where gouges are made into the surface and the ink rests on the remaining surface. 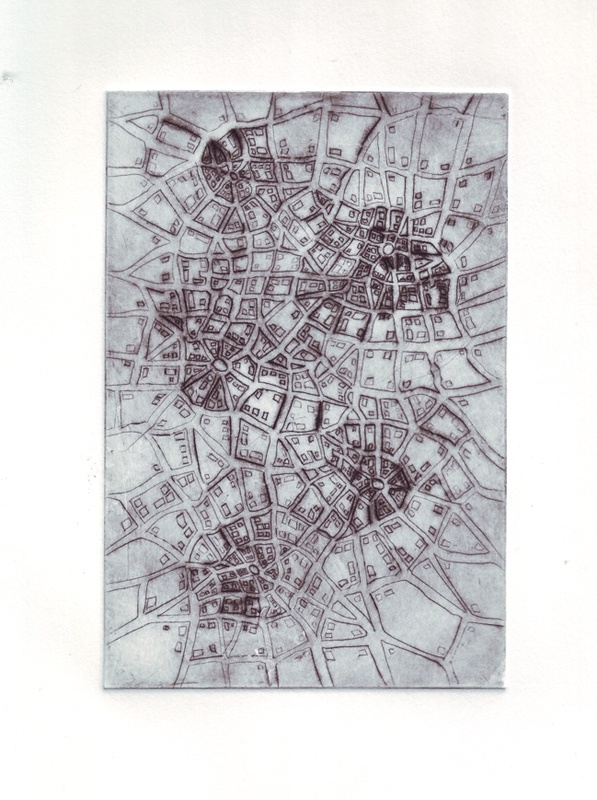 Drypoint, on the other hand, is an intaglio process (like etching or engraving), so the print is made by inking the plate and then wiping off all ink on the surface; the ink that sits in the engraved lines is printed onto the paper. 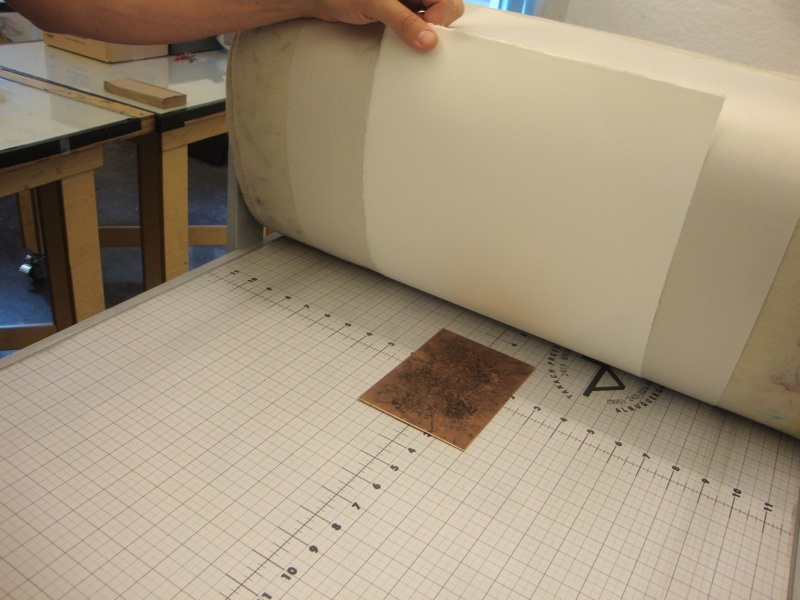 In drypoint the ink doesn’t just sit in the grooves, but is also caught by the minute burrs that form when you scratch into the surface. What’s counterintuitive about it is that large areas of black aren’t created just by a deeper groove, but mostly by a denser mat of crosshatching. 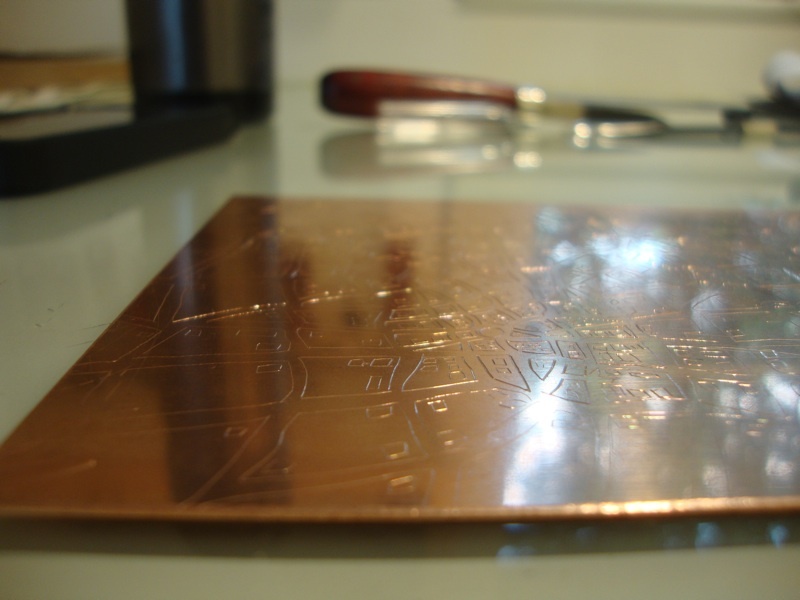 We started by learning about the tools and practicing on small pieces of copper, and then started our first plates using plexiglas. 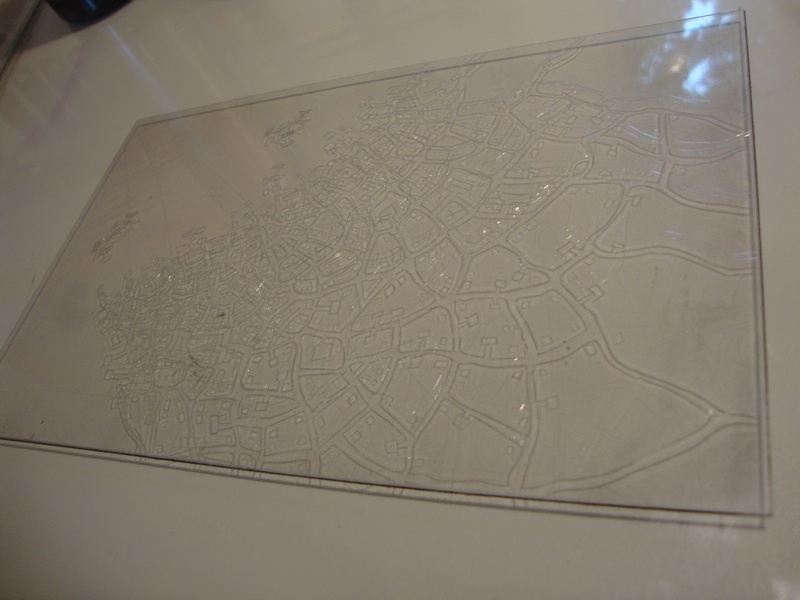 The biggest benefit of plexiglas for translating an image into a drypoint etching is that you can just place the image under the plexi (assuming it’s either been reversed or you’re okay with it printing backwards) and then trace over that with the etching tools. 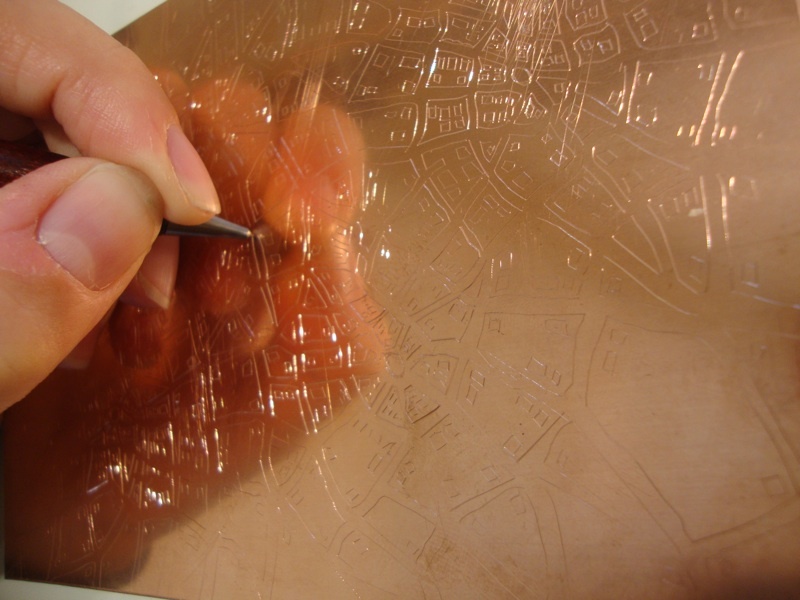 I also found that it was a little easier to control the tools over the soft plexiglas surface. Unfortunately, the cheaper material doesn’t hold the cuts as well, so apparently you can’t make as many prints from a plexi plate. Once you’re at a stopping point with a plate, the next step is inking and printing it. The hard part of inking is that you can’t just roll or brush ink on and then print — you have to meticulously work ink into the minute grooves (without disturbing the burr too much, since it does wear down), and then spend ages trying to wipe off the ink with a light enough hand that you don’t end up wiping off the parts you want to have ink. I only almost got the hang of it once we were out of time. 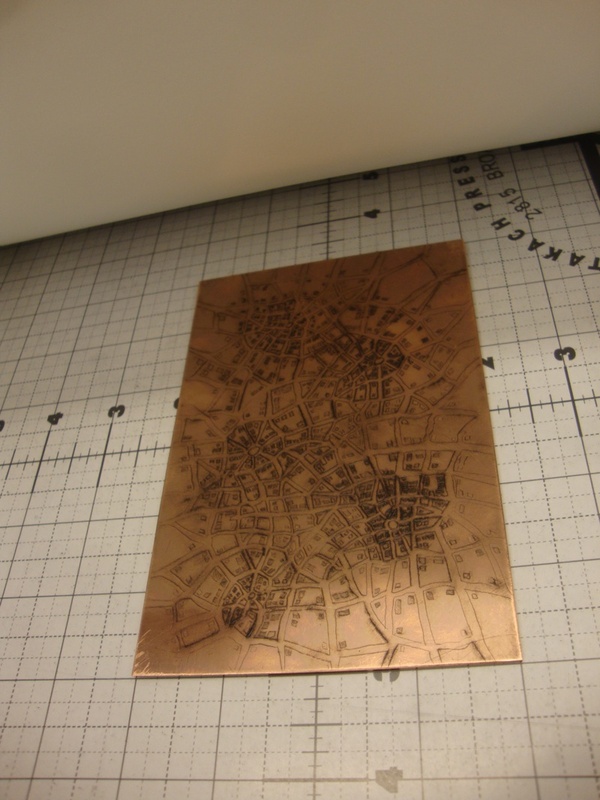 I made one print with plexi by tracing over a printout of one of my drawings, and then decided to do my copper plate completely freehand. I discovered that the process feels, surprisingly, less like drawing and actually more like making cutouts — you have to apply a lot more pressure, and be more aware of the quirks of the medium. MAJOR differences in terms of density, contrast and overall rhythm. I’d almost say it looks like a different city. 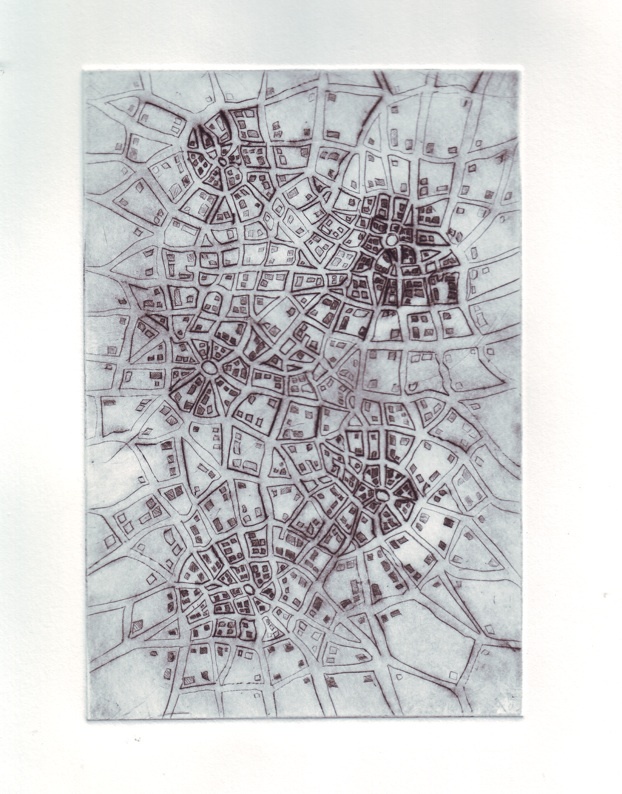 And that’s what I’m trying to explore — making maps that could be anywhere just with a few changes. I would definitely keep exploring this, as long as I can figure out some kind of reasonable way to get access to a large press like the one we used. Unfortunately that’s definitely necessary to get the kind of pressure you need for these prints. But it’s obviously worth it! 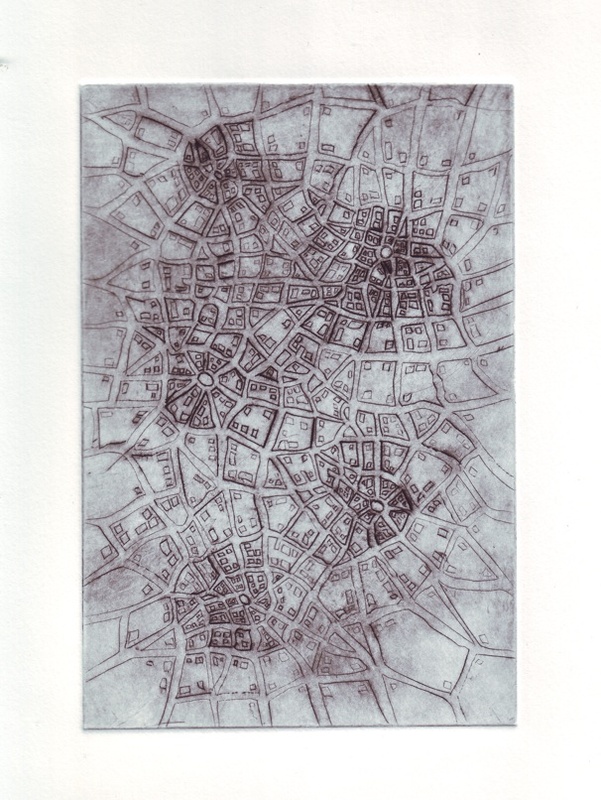 This entry was posted in updates and tagged printmaking by Emily Garfield. Bookmark the permalink.